Systemic Insight is an applied research and learning initiative of Mesopartner, lead by Marcus Jenal and Shawn Cunningham. The Mesopartner team are development practitioners that are passionate about more systemic impact within development. Finding more systemic intervention points are becoming more important as donors realize that interventions have to be more sensitive to the complexity of the societies where they want to see positive change happening. Mesopartner is an international economic development consultancy known for pragmatic development instruments and concepts. Since 2010 Mesopartner has been assessing its own methods, tools and concepts based on insights from systems theories and complexity theories. This site is born out of this internal process but also from the process of supporting our customers, our counterparts and our friends in making sense of systems theories and complexity. We thank our customers, like the SEEP Network, the various technology transfer centres at Universities of Technology in South Africa, and many other development projects accompanying us on this journey. Some of the podcasts that are featured on this site are part of the Systemic Monitoring and Evaluation (M&E) Initiative of the SEEP Network, in which Mesopartner is involved, and are co-published by SEEP. 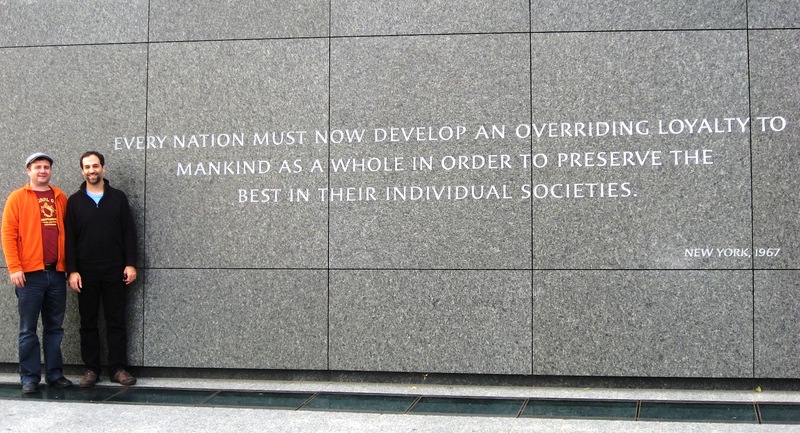 Shawn and Marcus at the Martin Luther King Jr. Memorial in Washington DC, admiring the quotes indicating that King was thinking in systems.